In case you haven’t noticed, Sea & Reef has dozens of designer clownfish options and they have just added two new variations. The new clownfish are called Mocha Vinci Extreme Clownfish and the Midnight Lightning Ocellaris. 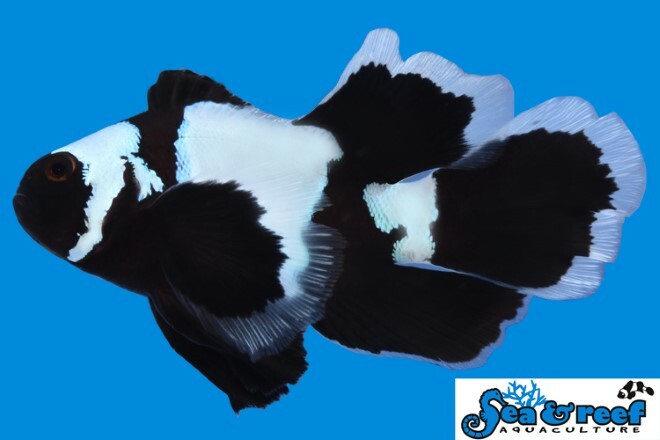 Sea & Reef created the MochaVinci Extreme Clownfish by breeding their Jet Black Ocellaris Clownfish (Darwin) with their DaVinci Extreme Ocellaris Clownfish. 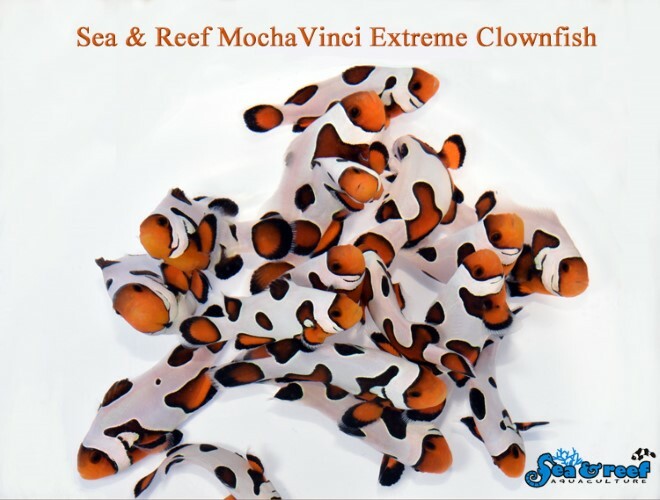 The MochaVinci Extreme has inherited the classic swirly white pattern of the DaVinci Clownfish, but the red coloration has been replaced by a more golden and black coloration similar to that of Black Ice Clownfish and Maine Mocha Clownfish. The white swirly patterns fall into the same variations as their DaVinci Ocellaris Clownfish with three different grades – Grade B, Grade A and Grade Extreme. MochaVinci Clownfish Grade Extreme have 3 fused stripes on at least one side of the body. This grade has the most white markings. Read more about the MochaVinci Extreme Clownfish on the Sea & Reef website. The temperament and captive care requirements for MochaVinci Clownfish are very similar to that of the regular Ocellaris Clownfish. The fish are relatively peaceful and hardy and they will thrive in saltwater aquariums with or without an anemone present. Most clownfish are omnivorous feeders, meaning that they will consume a variety of different food types. In nature the diet of clownfish consists of crustaceans (such as copepods and amphipods), algae, polychaete worms, and leftovers from the anemone’s meal. 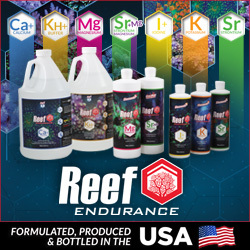 Sea & Reef captive bred fish are conditioned to eat a variety of aquarium diets including pellets, flake food, frozen Mysis shrimp, and frozen brine shrimp. MochaVinci Clownfish will readily accept a wide variety of host anemones. As a reference, the natural host anemones of the regular Ocellaris Clownfish are Magnificent Sea Anemone (Heteractis magnifica), Giant Carpet Sea Anemone (Stichodactyla gigantean) and Merten’s Carpet Sea Anemone (Stichodactyla mertensii). 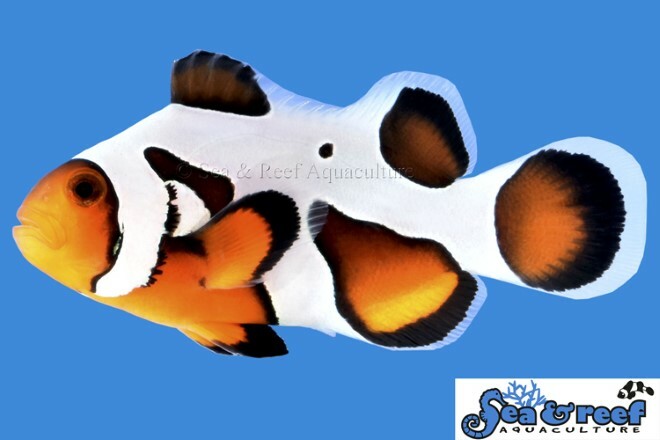 Sea & Reef now has 4 different types of designer longfin clownfish and the newest release was just announced on February 15, 2019. The longfin Clownfish are not new to the hobby, but Sea & Reef’s Longfin Clownfish have a much different look than other longfin clownfish you may have seen before. Their longfin clownfish have long flowing fins with a rounded, more even outline. This sets them apart from the typical longfin strain that display jagged, stiff fins with uneven edges. The changes in physical characteristics are due to the differences in the genetic makeup of the Phantom longfin. The mutation that created the longfin clownfish came from a single fish. 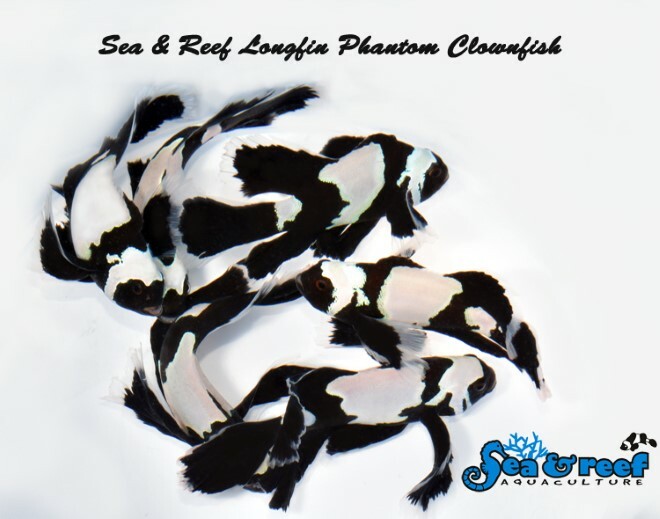 In December 2013 Sea & Reefs Hatchery Manager Brandon Weik was looking into a tank of several thousand Black and White Ocellaris (also called Darwin Ocellaris). He spotted a fish that looked very different than his brothers (all clownfish are born male). It had long flowing fins and was getting beaten up, probably because of its different look. The fish was isolated and later paired up. A story was published about their findings on Reef Builders in April 2014. You can read the article by clicking here. Black and White Longfin Clownfish was paired up with our Phantom Clownfish to create the Longfin Phantom Clownfish. The temperament and captive care requirements for the Longfin Phantom Clownfish is very similar to that of the regular Ocellaris clownfish. It is relatively peaceful and hardy. They thrive in saltwater aquariums with or without an anemone present. Most clownfish are omnivorous feeders, meaning that they will consume a variety of different food types. In nature the diet of clownfish consists of crustaceans (such as copepods and amphipods), algae, polychaete worms, and leftovers from the anemone’s meal. Captive bred fish are conditioned to eat a variety of aquarium diets including pellets, flake food, frozen Mysis shrimp, and frozen brine shrimp. Longfin Phantom Clownfish will readily accept a wide variety of host anemones and many hobbyists keep them with the popular and hardy Bubble Tip Anemone (Entacmaea quadricolor). As a reference the natural host anemones of the regular ocellaris clownfish are Magnificent Sea Anemone (Heteractis magnifica), Giant Carpet Sea Anemone (Stichodactyla gigantean) and Merten’s Carpet Sea Anemone (Stichodactyla mertensii). Until now I haven’t been a big fan of the longfin clownfish but the Phantom longfin might tip the scale to the plus side for me. Regardless, beauty is in the eye of the beholder and we are excited to see what Sea & Reef comes up with next.